Shaun McKeown was selected to represent the UK in the Paracycling Pursuit, Time Trial and Road Race in the 2012 London Games. 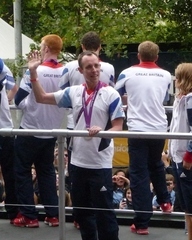 Born in Lewisham on 2nd March 1980, Shaun studied for a computer science degree and worked as a database developer for a number of years, before joining the British Cycling Academy Programme. A dedicated cyclist he attended a talent ID day held in Sheffield in early 2009 where he was put though a variety of tests, and was subsequently selected for the Para-Cycling Development Team. He won a silver medal in the C3 men’s individual pursuit at the Velodrome on Friday 31st August 2012.